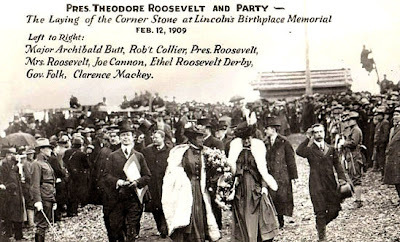 In a ceremony at Hodgenville, Kentucky, at the old Lincoln 110-acre farmstead, President Theodore Roosevelt laid a three feet square cornerstone for a granite and marble neo-classic memorial building to enshrine a symbolic replica of the log cabin at the site in which Lincoln was born. It was long known that Roosevelt greatly admired Lincoln. “Lincoln, he said, led the formation of a new Republican party when the old Whig party ceased to 'help the people'; Roosevelt followed in his footsteps. Lincoln hated slavery and fought against it all of his life; Roosevelt hated and fought the idea that 'it is one man's duty to toil and work and earn bread and the right of another man to eat it'.” (2) He also said about Lincoln, “Lincoln was the first who showed how a strong people might have a strong government, and yet remain the freest on the earth.” Roosevelt saw Lincoln as honest and reforming and was often guided by Lincoln's philosophy, wisdom and politics. The memorial building was completed in 1911 under the administration of President Taft and has 56 steps leading up to the building, representing his age at the time of his death.